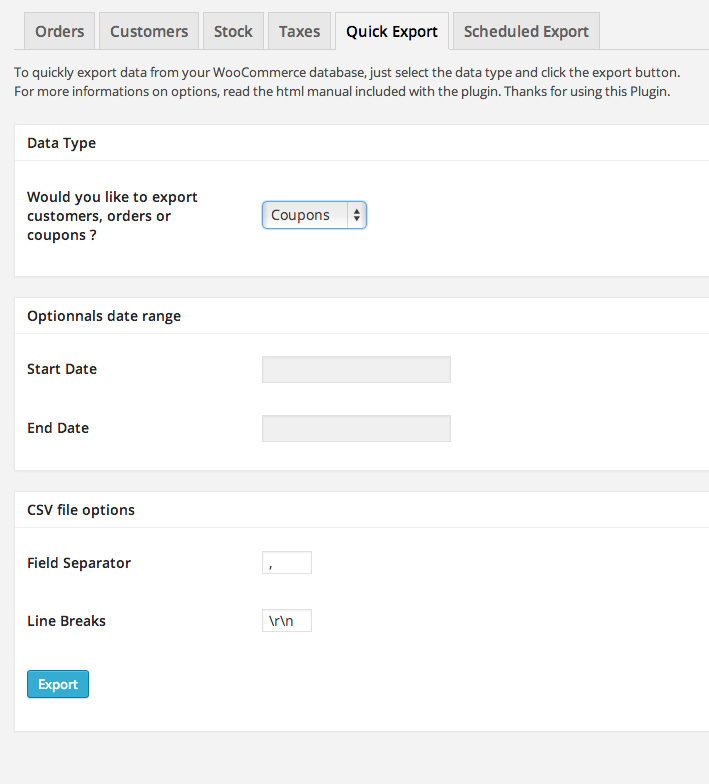 WooCommerce Quick Export Plugin gives you the ability to export into CSV file all your WooCommerce customers and WooCommerce orders in just one click. A great way to analyse more easily your store activity or transfer the data in another software. Get accurate data from your customer including email address and sales statistics. This is a great tool for specific emailing actions. There are four pre-configured sets of data when exporting customers. You need to select at least one. For each sets of data their are corresponding columns for your upcoming csv file. Where nb_order is total number of completed orders made by the customer and amount_total sums each completed orders made by the customer. If you want to export customers data only for a specific period of time, you can specify start and end date using the two dedicated field. To select the desired date just click on the field to popup the calendar and select one day. You can’t select a day in the future. You don’t have to specify two dates. During customers export, the date filter filters the data based on registration date of users. Orders data concerning each customers will be selected within these two bounds. 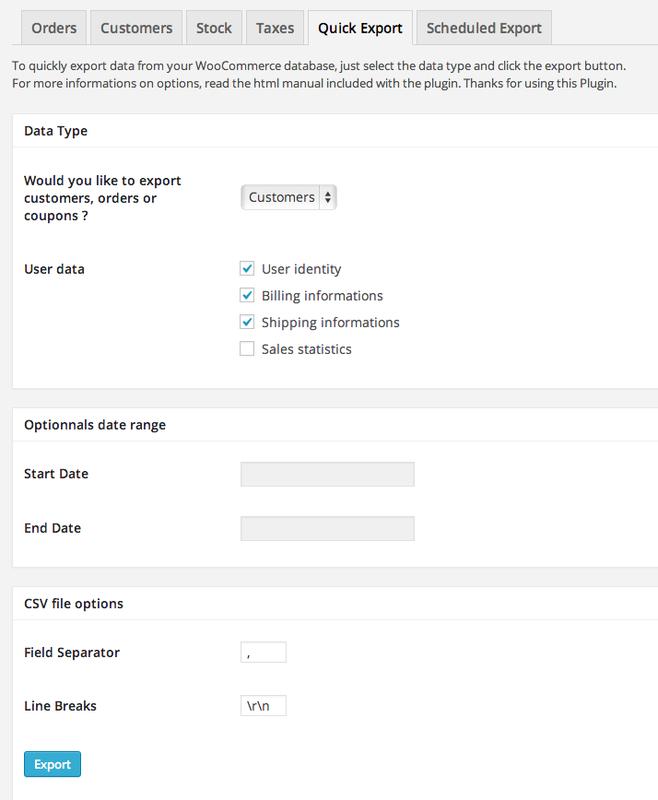 Get WooCommerce reports in csv to make greats offline analysis, statistics and much more. Every field of any order can be exported or just few of them for easy readability. You decide ! The plugin will automatically lists all available order status in your WooCommerce installation. Native status and optionally extra status developed by yourself or third-party plugins. Note that status without any order won’t be displayed. The number beside each status represents the actual number of orders stored in the database. If you want to export orders data only for a specific period of time, you can specify start and end date using the two dedicated field. To select the desired date just click on the field to popup the calendar and select one day. You can’t select a day in the future. You don’t have to specify two dates. wqep_included_user_identity_keys_filter (an array of keys used against the customer object). These fields will be used and included in your csv files when “User identity” is checked in the Customer Export Screen. wqep_included_billing_information_keys_filter (an array of keys used against the customer object). These fields will be used and included in your csv files when “Billing Informations” is checked in the Customer Export Screen. wqep_included_shipping_information_keys_filter (an array of keys used against the customer object). These fields will be used and included in your csv files when “Shipping Informations” is checked in the Customer Export Screen. wqep_included_order_keys_filter (an array of keys used against the order object). 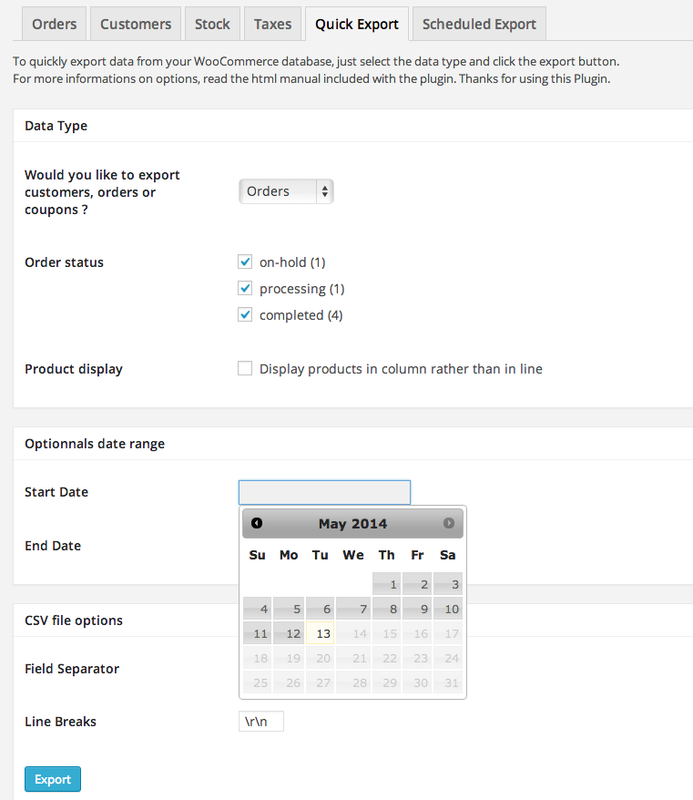 These fields will be used and included in your csv files when you are exporting orders. wqep_status_for_user_activity_filter (an array of order_status used when calculating user activity in the export users panel). Default is array(‘completed’). 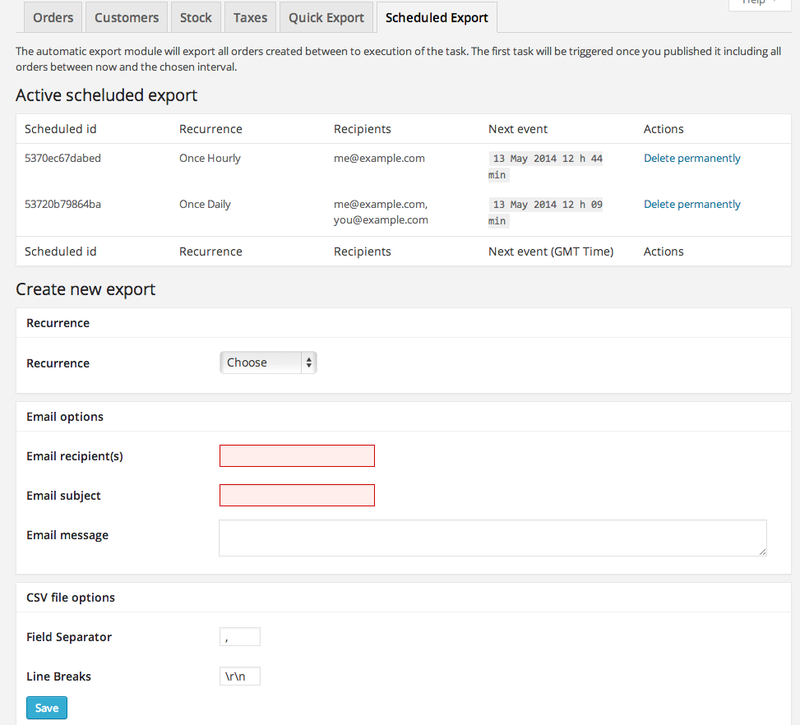 By programming automated export (in the dedicated tab) you can add cron task to tell WooCommerce to send by email customer and / or order export. For instance, you can receive every day, all orders from the day, every day. Or create for your boss an automated monthly report i will be able to open in Excel. We recommend you to use Open Office rather than Excel to import your CSV file. - Support for WooCommerce 2.1 update. -Order export now includes coupons names and coupons amount used in each order.